USB drives, MP3 players, CDs, DVDs, and other removable media, however useful, pose a real threat to your organization. Their small size and enormous storage capacity make it all too easy for confidential customer data and intellectual property to walk right out the front door and fall into the wrong hands—whether that’s through loss or theft. How do you know who is storing what on which type of device? And even if the person or persons have permission to use the data, how can you be sure they are keeping it secure? McAfee® Device Control protects critical data from leaving your company through removable media such as USB drives, Apple iPods, Bluetooth devices, and recordable CDs and DVDs. It gives you the tools to monitor and control data transfers from all desktops and laptops—regardless of where users and confidential data go, even when they are not connected to the corporate network. Comprehensive device management—Enable safe use of removable media devices—no need to “block all” and hinder work productivity. McAfee ePO centralized management platform—Centrally deploy and manage security policy to prevent confidential data loss via removable media. Complete visibility—Prove internal and regulatory compliance measures to auditors, board members, and other stakeholders. Gain visibility and manage what and how users copy valuable company data to removable media. Monitor and regulate (with granular controls) how your employees transfer data to removable media, such as USB drives, MP3 players, CDs, DVDs, and Bluetooth devices — even when users are not connected to the corporate network. Specify detailed hardware- and content-based filtering, monitoring, and blocking of confidential data on any removable storage device. Ensure that employees continue to use allowed devices safely. Use the centralized McAfee ePolicy Orchestrator (ePO) console to implement and enforce security policies that prevent confidential data from leaving the company’s control and being lost or stolen. Comprehensive device management helps control and block confidential data copied to removable storage devices. Device parameters such as product ID, vendor ID, serial number, device class, and device name can be specified and categorized. Furthermore, different policies such as block or encrypt can be enforced based on the content loaded onto the devices. Support for plug-and-play devices and removable storage devices. Integration with McAfee Endpoint Encryption for file folders and digital rights management (DRM) solutions. File access protection for files that reside on removable storage devices. The Citrix device rule blocks access to the thin-client device mapping: local drives, removable storage, printers, CD/DVD, clipboard, and more. Non-system hard disks rule blocks and monitors read-only files and provides notifications of user actions on fixed disk drives. Integration with McAfee® ePolicy Orchestrator® (McAfee ePO™) software offers real-time event monitoring and centralized policy and incident management. It allows for easy collection of critical-usage data, such as sender, recipient, time stamp, and data evidence. With a click of a button, McAfee ePO software offers detailed reports to prove to auditors, senior management, and other stakeholders that internal and regulatory compliance measures are in place. Deploy and update McAfee Device Control agents via McAfee ePO software. 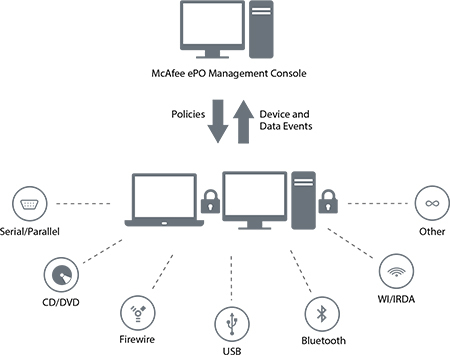 Manage McAfee Device Control policies and incidents via McAfee ePO software. Integrate with McAfee ePO software for event monitoring, centralized reporting, and auditing capabilities. Set role-based access control (also known as separation of duties) by McAfee ePO software for incident review. Notify violators and/or managers automatically. McAfee Device Control specifies which devices can be used and what data can be copied. 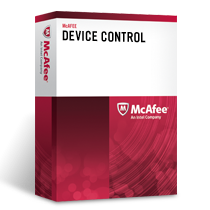 Download the McAfee Device Control Datasheet (PDF).